His sturdy form and gait are vaguely reminiscent of Dr Johnson, but, instead of a wig, from under his small felt hat his thick iron-grey hair streams down as stiff as wire. To set eyes on him thus, specially if the weather was not too mild for him to be enveloped in his great cape-overcoat, warmed you with a feeling that life had not yet been reduced quite to a dead level, that the free Bohemian spirit which quickened the world of literature in its golden age was not yet extinct, nor the glorious individuality of Fleet Street wholly departed from it (St John Adcock, quoted in Valentine, 98). Towards the end of August 1914, the small number of British troops on the Continent suffered a reverse at the Battle of Mons, and were forced to retreat before a much larger German force. A month later, on 29 September 1914, the Evening News published a short story by Machen called “The Bowmen”. In the thick of the fighting at Mons, a British soldier murmurs a old prayer he has remembered: “May St George be a present help to the English.” The saint’s name is taken up by a thousand shining archers, who fire at the Germans and stem their attack. Afterwards, the German generals decide that the English must be using some new type of gas, as there were no wounds on the dead soldiers. Machen acknowledged that he was inspired by Kipling’s “The Lost Legion” (1893), in which a British force in Afghanistan is aided by ghosts; and, of course, he remembered the great victory of the English archers in 1415 at the battle of Agincourt, the site of which the British troops passed by as they retreated in 1914. By the spring, many people had come to believe that there had been supernatural assistance at Mons, and some claimed to have witnessed it. There were variants: some said that St George appeared, and/or an army, more often of medieval knights than archers; others said that a cloud set itself up as a barrier, while others claim that angels had put themselves between the British and the Germans. The latter story predominated, and the legend came to be called that of the Angels of Mons. 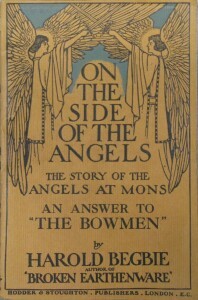 Harold Begbie’s On the Side of the Angels (1915) accused Machen of being a liar for claiming that he had invented the story of supernatural intervention at Mons, and quoted a number of soldiers whom he claimed to be eye-witnesses. He suggested that telepathy was responsible for Machen’s inspiration: “Mr Machen, on that Sunday morning, when he read with supreme sympathy that ‘awful account’ in his newspaper … may have received from the brain of a wounded or a dying British soldier in France some powerful impression of the battlefield at Mons” (Begbie 21). Unfortunately (unfortunately for Begbie, that is), one of Begbie’s main named eye-witnesses to the Angels turned out not to have arrived in France until a month after Mons. Machen himself contributed to the debate in 1915, when he published a little 86-page booklet whose title page, under the heading The Angels of Mons, proclaimed it to be The Bowmen and Other Legends of the War (London: Simpkin, Marshall, Hamilton, Kent and Co, 1915). He reprints “The Bowmen” and three other Great War stories: “The Soldier’s Rest”, “The Monstrance” and “The Dazzling Light”. There is a 22-page introduction in which Machen gives his view of the story. He utterly denies the claim that someone had presented him with an account of an actual vision at Mons, a few weeks before the story was published. Then, in the spring of 1915, he began to hear accounts of what had allegedly happened, which sometimes chimed in very closely with the details in the story. One version he heard claimed that the Germans had found arrow wounds on the bodies of the dead. This version amused me, as I had imagined a scene when I was thinking out the story, in which a German general was to appear before the Kaiser to explain his failure to annihilate the English. “All Highest,” the general was to say, “it is true, it is impossible to deny it. The men were killed by arrows. The shafts were found in their bodies by the burying parties.” I rejected the idea as over-precipitous even for a mere fantasy. I was therefore entertained when I found that what I had refused as too fantastical for fantasy was accepted in certain occult circles as hard fact (16-17). Machen suggested that his use of “shining” to describe his bowmen had led people to think that what appeared were not bowmen but angels, and he notes that in England saints, even St George, are not really believed in (that’s for Catholics) and that therefore, to Anglicans and others, angels were acceptable where St George was not. David Clarke has offered a detailed analysis of the phenomenon in “Rumours of Angels: A Legend of the First World War”, Folklore 113 (2002), 151-173, which he expanded into his book The Angels of Mons: Phantom Soldiers and Ghostly Guardians (Wiley: Chichester, 2004). In the book Clarke suggests that the sudden appearance of stories of the Angels in Spring 1915 may be no coincidence: it may have been the result of the deliberate attempt to circulate the stories by British intelligence, to raise morale in an army now hopelessly mired in trench warfare and in a population beginning to suffer. The myth may have been produced in England rather than in the trenches. Clarke has established that there is no evidence of a story about supernatural intervention until well after Machen’s story. Paul Fussell in his great book on The Great War and Modern Memory (Oxford: Oxford University Press, 1975) is wrong to say that “within a week Machen’s fictional bowmen had been transformed into real angels” (116), but right, perhaps, to say that soon “it became unpatriotic, almost treasonable, to doubt it.” Machen was a writer of fantasy and science fiction who had a real impact on people’s thinking during the Great War. The legend remained a matter of dispute for some time after the War. In 1930, newspapers in New York and London printed a new variation, credited to Colonel Friedrich Herzenwirth, formerly of the Imperial German Intelligence Service. The Angels of Mons were “motion pictures thrown upon ‘screens’ of foggy white cloudbanks in Flanders by cinematographic projecting machines mounted on German aeroplanes which hovered above the British lines.” The idea had been to induce panic among the British, but it had backfired. The same newspapers soon published a response from Germany, which said that Herzenwirth did not exist, and that the story was a hoax (Clarke 2002, 168-169). There are some interesting comments on the Angels of Mons in Stefan Goebel, Medievalism in the Commemoration of the Great War in Britain and Germany, 1914-1939 (Cambridge: Cambridge University Press, 2001), 247-248, and there is a fascinating chapter by Tim Cook in Jennifer D. Keene and Michael S. Neiberg, ed. Finding Common Ground: New Directions in First World War Studies (Leiden: Brill, 2011), which puts the Angels into a context of rumours and “urban myths” in the First World War, focussing on the material from the Canadian troops. One of the widespread trench rumours was that a group of deserters survived in No Man’s Land, living like ghouls, and coming out to plunder the dead at night: this is used by Kim Newman in his contemporary novel The Bloody Red Baron, which reimagines the Great War in a Europe dominated by vampires.